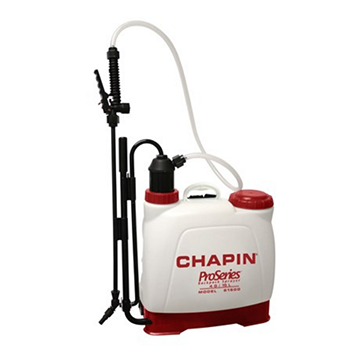 Chapin Pro-Series™ 4 Gallon Back-Pack Sprayer. The Chapin four gallon ProSeries™ back-pack sprayer features a locking trigger for a continuous spray and padded straps for comfort. Can be used for herbicides and pesticides. See below for additional information on operation and maintenance. Chapin ProSeries™ four gallon backpack sprayer. The four gallon sprayer has a 25 foot max spray stream and is ideal for the homeowner who wants to spray herbicides, pesticides, and fertilizers around their home. The sprayer comes with a 3 piece nozzle kit. Manufactured by Chapin International, Inc. This is the first backpack sprayer I have owned which doesn't leak out of the bottom after awhile. All of the outlets are on the top! Great sprayer.